We laughed a lot, we learnt a lot! What an amazing day we had with The Young ‘Uns at Thringstone Community Centre. 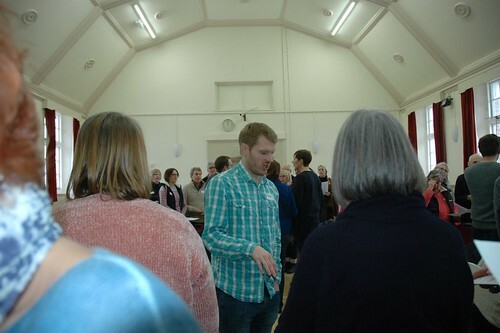 In spite of the awful wintery weather which still gripped the country after a week of icy blasts over 60 workshop participants braved the conditions for what turned out to be a superb day of song and laughter. Well known for their good humoured banter and ready wit, Davide Eagle, Sean Cooney and Michael Hughes taught Roots Community Singers and many visitors the rudiments of three part harmony with the aid of rounds, counting songs and their own self-penned songs which feature on current and recent CDs. We were also treated to the boys singing beautiful renditions of the very appropriate … When The Snows Of Winter Fall and Sean Cooney’s poignant Jenny Waits For Me In Old Hartlepool.